This weekend’s commencement for the UO School of Law was a celebration that resonates with confidence and reflects a powerful optimism for the future. At a time when legal education nationwide has faced challenges in decreased enrollment, this year’s graduates used the occasion to cheer their decision to attend Oregon Law. 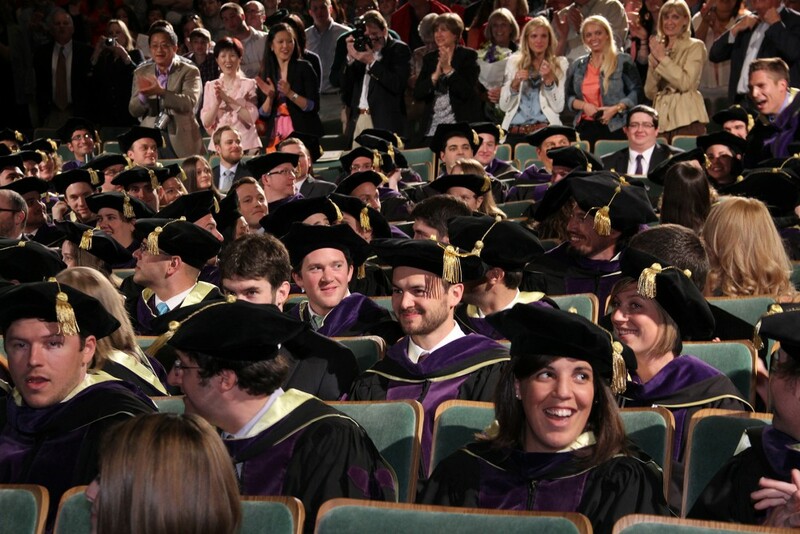 A graduate list of 135 students received their juris doctor or master of laws degrees at the Hult Center for the Performing Arts in Eugene on Saturday, May 16. Among them were students from China, Nigeria, Mozambique, Russia and Ghana. Their interests span family law, business, criminal prosecution, criminal defense, juvenile law and the environment. Approximately half will work in Oregon, while many others will find work in Washington and California. The American Bar Association places a limit of seven years to complete law school, but almost all UO students finish the program in three years. Some members of the class of 2015 have accomplished something even more impressive: earning their law degree while balancing the demands of being a parent. Beatrice Grace, a single mother and former emergency room nurse, is embarking on a new chapter of her life. Saturday’s commencement address was given by the Honorable Michael J. McShane, U.S. District Court Judge for the District of Oregon. McShane, a native of Kennewick, Washington, was nominated to the federal court by President Obama in 2012 and has been committed to helping at-risk youth. He spent six years on the board of St. Andrew Nativity School, a tuition-free middle school designed to prepare children living in poverty for a college education. In his own life, McShane is an adoptive and foster parent. Oregon Law faculty emeritus Dominick Vetri received this year’s Meritorious Service Award, and Joan Rocklin, a professor in Oregon Law’s top-ranked legal research and writing program, received the 2015 Hollis Award for excellence in classroom teaching. Former President Dave Frohnmayer, who died this year, was selected to receive an honorary Hollis Award posthumously. To view a series of videos featuring members of the law school’s Class of 2015, visit the school’s website.